Inky Antics Chocolate plus I also purchased the Scented Smiles for the chocolate. So here is my first scratch and sniff card . 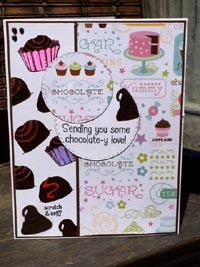 The white paper has the different chocolate stamps and the other paper used was from Recollection . Make sure to stop by and check out the challenge . The chocolate theme is such fun! Love the colors and the way you used the sketch! So fun.. I love it!